Who would have thought that currency markets could be responsible for half of the move in oil prices. Low oil prices have hit shale drilling hard, and you may be surprised to find what's driving them lower. Image source: LINN Energy. Oil prices have surged to near $60 per barrel for WTI crude oil in recent weeks and it would appear that the days of cheap oil and gasoline are over. Most people would point to shale oil or OPEC as the recent driver of oil prices, but there's a hidden hand in the market that may have more influence than you think. The world of currency trading has been a big driver of not only oil's decline, but also its recovery in prices. 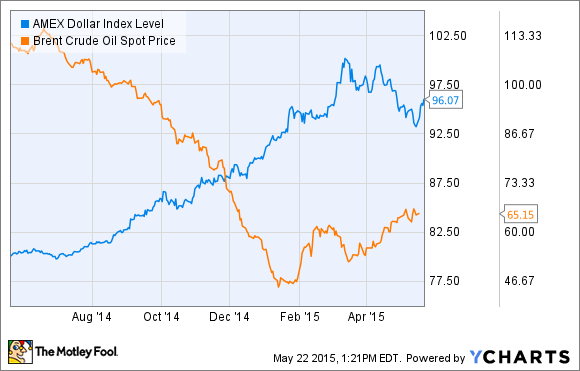 Unlike most of the products we buy on a daily basis, oil is priced in a global market. If supply increases from Saudi Arabia it has consequences in Oklahoma and if demand increases in China it will impact prices in New York. What this global market dynamic does is bring currencies into the fold in ways that we don't usually see on a daily basis. Sure, a company's earnings might go up and down in any given quarter depending on how the dollar is moving, but the price of a gallon of milk or a tube of toothpaste doesn't usually change much whether the dollar is strong or weak. Oil is different. When the dollar gets stronger it means products can be bought for less currency compared to the rest of the world. In energy, it means each dollar can buy more oil than it could before, so a stronger dollar should mean lower oil prices. You can see in the chart below that the drop in oil prices happened to coincide with a strengthening of the U.S. dollar. When the dollar stopped rising and actually fell in recent months oil reacted by moving higher. I'm not suggesting that all of the movement in oil over the past year has been due to the dollar, but according to the AMEX Dollar Index the dollar is about 20.1% stronger than it was a year ago. Oil is down 41.5% over the same time frame and a strong dollar helped to drive the drop in oil prices. This isn't the first time this has happened either. The last time the dollar dropped significantly from 2002 to 2005 it coincided with a sharp rise in oil prices (the opposite of what we're seeing today). 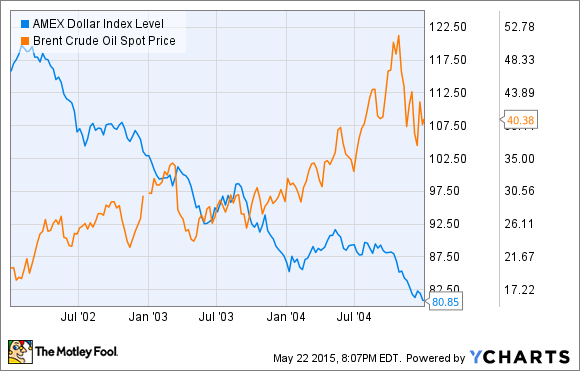 The dollar doesn't drive all changes in the price of oil, but it's an underappreciated component to the market. OPEC has gotten a lot of the attention of those seeing oil prices tumble (including from me) and its a part of the picture. But the cartel is a cog in a much larger oil market and currency trading has arguably played a bigger role in the drop in oil prices than OPEC's decision to keep production flat. Ironically, currency changes have hurt U.S. oil producers, who are producing oil that appears to be more expensive around the world than say oil produced in Russia, where the ruble has dropped in 2015. That's why you're seeing U.S. producers shut down drilling and countries like Russia are actually increasing oil supply. Sometimes forces that you wouldn't even consider drive prices for the things we use everyday. In the case of oil, the strong dollar may have a bigger impact on what you pay at the pump than you think and it is having a big affect on where oil production is growing and where it's slowing down.